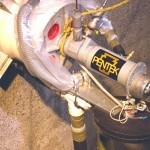 Respirator-Free Decon of Charging Pump Cells at Indian Point 2 | Pentek, Inc.
Consolidated Edison Company of New York reports using a Pentek supplied dustless decontamination system to decontaminate two charging pump cells at Indian Point 2. Years of deposits from radioactively contaminated water were covered with several layers of paint contributing to high dose rates in the cells. Samples taken from the floor showed both smearable and fixed beta contamination. Fixed contamination in the paint also produced high gamma readings. Con Edison targeted the cells for cleanup as part of their overall plant contamination reduction program. Con Edison performed concrete scabbling operations using the SQUIRREL®-III to remove just over 1/8-inch of paint and surface concrete from the 150 square feet floor of each cell. The Corner-Cutter® was used to remove paint and concrete from the pump pedestals. Dust-free operation of the SQUIRREL®-III and Corner-Cutter® was assured by the use of Pentek’s electric powered VAC-PAC® Model 10. The VAC-PAC® effectively captured concrete dust and debris from the scabbling operation. The entire job was completed in a dust-free environment. Based on results from continuous monitoring of airborne contamination, the use of respirators was not required. Approximately one-half of a 55-gallon drum of concrete debris and paint was removed from the two cells. Subsequent to the cleanup, the floors showed no smearable contamination and the only dose readable in the area was from equipment in the cells. The floors were resurfaced with a self-leveling coating system. As part of an ongoing commitment to removing contamination fixed in plant floor coatings, Con Edison recently purchased a second SQUIRREL®-III. Currently Con Edison is using the equipment to perform dustless surface preparation on hallway flooring. The two SQUIRRELs, connected to the VAC-PAC® Model 10, are being used side-by-side in a joint effort to scabble an area six feet wide and approximately 80 feet long. After the surface preparation is completed, the floor will be resurfaced with a new coating. For more information please email us, see our contact page or visit our hand tool vacuum and robotics product pages.